A mathematician by training, Zia Haider Rahman’s debut novel is a literary masterpiece. It is a deeply unsettling novel where the protagonist’s ‘descent of hope’ reveals our loss of a shared humanity. The novel is a magisterial sweep of the landscape of the 21st century that is characterized by war, migration, and rootlessness. Rahman grapples with the age-old question of knowledge of do we know what we know by offering Godel’s Incompleteness Theorem. Unfortunately, pure mathematics fails to not only give us answers to life’s complex questions; it also fails to give answers to its own questions. 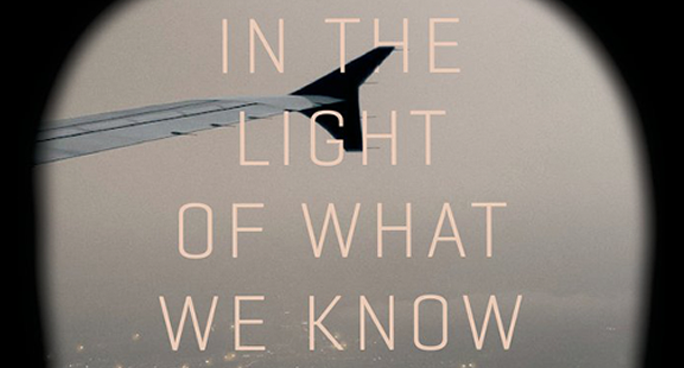 In the Light of What We Know is a deeply postcolonial novel about the ambivalences of globalization, excessive greed, military power, and our capacity to dehumanize the other. It has been compared to Naipaul’s A House for Mr. Biswas and to Fitzgerald’s The Great Gatsby, novels that have distilled feelings that have defined an age. The New Yorker’s literary critic James Wood, who is very parsimonious with his praise, has written a 4,000-word tribute calling it “dazzling.” What are we to do in a world that is so bewilderingly full of promise and of senseless hatred? How do we navigate between truth and falsity, between knowing and not knowing, between human arrogance and its terrible consequences? How do we remain human in this world of “unbearable inconsistencies, in a world where black is white and white is black, and there is no way to tell the apart (552). “…that understanding is not what this life has given us, that answers can only beget questions, that honesty commands a declaration not of faith but of ignorance, and that the only mission available to us, one laid to our charge if any hand was in it, is to unfold the questions, to take to the river knowing not if it runs to the sea, and accept our place as servants of life” (553). With over 500 pages of such dense writing, the novel is not an easy read. Sometimes the author’s many segues and philosophical excursions tax one’s concentration. Yet the novel weaves together an abundance of issues––race, class, belonging, loss, immigration, Englishness, the 2008 financial crisis, the war in Bangladesh in 1971, the US war in Afghanistan in 2002. It is dotted with copious footnotes. There are so many thoughts entangled here that make it impossible for any one to do justice to them all. I leave that to future generations of English literature PhD students. At the outset, it should be noted that Rahman engages with a range of western thinkers from Godel to Einstein to Coleridge and many more. Each chapter begins with three to four epigraphs from writers and philosophers who have shaped the intellectual tradition in the west. While one could argue that Rahman has engaged only with western thinkers, one cannot ignore the fact that is his training. But one should recall that Rahman is writing when postcolonial studies are firmly entrenched in college curricula. While Said is mentioned a couple of times, and Tagore once, there is an odd absence of thinkers from the east. One fails to understand why that is the case. Simply put, there are many postcolonial thinkers who write in English or who have been translated. Educated at Balliol College (Oxford), and then Cambridge, Munich and Yale, Rahman has been to the best of the best. Perhaps postcolonial studies are not that popular in these schools. Rahman was not born with a silver spoon in his mouth. Born in rural Sylhet, Bangladesh, he went to England soon after 1971. His father worked as a bus conductor and then as a waiter, while his mother was a seamstress. They lived in the projects of London. As he says in the Guernica interview, “We moved to the UK where I grew up in poverty, in some of the worst conditions in a developed economy, before moving to the projects—heaven—and I went to unremarkable schools before going to university.” Growing up as a working-class Bangladeshi immigrant in London in the 70s and 80s was not easy but he made it to Balliol College, the most prestigious of Oxford’s colleges. He later became a human rights lawyer. Not surprising then that justice and fairness are compelling motifs in the novel. In the Light of What We Know is a story of two South Asian male friends living in London. We know the name of only one of them (Zafar), while the other is a nameless Pakistani who narrates the story from notebooks given to him by Zafar. One day after the financial crisis in 2008, a disheveled Zafar shows up at his friend’s doorstep in Kensington. The two friends meet after many years. They had first met at Oxford as students of mathematics. Zafar is by far the sharper of the two. They mirror each other. Zafar is from Bangladesh and working-class; his friend is from a Pakistani family of privilege. The friend’s father was a Princeton and Oxford professor, his mother a psychotherapist, and the parents rubbed shoulders with the likes of Hamid Karzai. We know less of Zafar’s background. His relationship with his immigrant parents is one of shame and loss. But there is another life that Zafar has left behind “in a corner of that corner of the world” known as Sylhet. It is this riveting subtext that is only alluded to in the novel but never narrated. Zafar has a compulsion to narrate this story (hence the reference to Coleridge’s Rime of the Ancient Mariner) but it eludes speech because it is history’s unspeakable horror. The foreshadowing of the longings that define an immigrant’s life is set early in the novel. Standing below the Statue of Liberty, Zafar says to his friend, “If an immigration officer at Heathrow had ever said ‘Welcome home’ to me, I would have given my life for England, for my country, there and then. I could kill for an England like that.” As the narrator later remarks as he pieces together the puzzle that is his friend’s life, “Can it really be true that everything that was to follow might have been averted by one kind remark from an immigration officer?’ How many have witnessed the harsh cruelty of the unblinking immigration officer standing behind the little cubicle? And herein lies the pathos echoed so many years ago by E. M. Forester in A Passage to India “no, not yet,” and “no not there.” What happens to this generation caught in limbo? In today’s world, education is the pathway to upper classness but for the Zafars of this world that journey is covered in landmines. To belong to this new class is to break with one’s past. So, his parents come to visit him at Oxford only once, and that too to help him move out of his dorm at 7:30 in the morning before anyone is astir (5). In his effort to be English, Zafar says “please and thank you” to the Bangladeshi woman who raised him. “I had turned the web of duties that bound a family together, into the mere exchange of favors, thank you and please standing for reciprocation” (157). In his later years, Zafar had “little to do with them” and the most time he spent was during one month when they needed help with their mortgage. “Once three years went without contact” (481). Through all this, there is tremendous rootlessness in Zafar’s life. He wants to belong, but his relationship with his white English girlfriend too is doomed. In England, class has hardened along racial lines as the children of working-class South Asian immigrants have begun to make it into Eton, Harrow, Oxford, Cambridge. But getting admission to these colleges does not mean being accepted by English society. Zafar’s very upper-class girlfriend Emily Hampton-Wyvern never introduces him to her friends, and the only time he asked her to marry him “She let out a small little laugh, a perfectly formed ladylike laugh. Just enough. And I said nothing more” (381). One could almost liken her to Daisy Buchanan of the Great Gatsby. At the Hampton-Wyvern’s home, Emily’s mother Penelope Hampton-Wyvern offers Zafar a Bath Oliver with his afternoon tea. He confuses the name of the biscuit with taking a bath. These are small matters but they show the class distance between Zafar and Emily. Zafar astutely ponders to what extent are the Hampton-Wyverns equally trapped by their class position. In Penelope Hampton-Wyvern’s living room every item “spoke of an observance of a written rule.” Being upper class meant that one’s “preferences are so obviously conditioned by” one’s “social milieu” (239). The novel is a constant reminder of the hubris of thinking that we know when we do not know. People in Afghanistan may not want us to bring progress and democracy, especially from do-gooder INGO consultants who could barely find Kabul on a map six months prior to their Afghan assignment. Zafar’s Emily is one such person who is imbued with a secular missionary zeal to bring change, but you could probably substitute Afghanistan for some other godforsaken third word country, and it would not matter to the Emilys of this world. And though I have no hard ground on which to base my speculation, the thought pleases me that at some time in those years he disappeared, my friend might have paid a visit to that area of the world, to the place he had been the happiest, as he once said, with the woman who had loved him (552). We know nothing of his time in Bangladesh. We know nothing of the woman who gave birth to him. But as the subtext is revealed we understand better the relationship between the protagonist Zafar and his alter ego, the nameless Pakistani. There is a debt between Zafar and his friend who stands in for Pakistan, and who is compelled to narrate Zafar’s story in fragments. Perhaps that story can only be narrated when the people of Bangladesh and Pakistan can embrace the history of 1971 in all its horror and consequences. In writing this subterranean text of those children born in 1971 to women who had been raped, Rahman has opened a deep wound in these two nations’ psyches. Pakistan has never acknowledged the rapes and the children that were born of this violence in 1971. Bangladesh has failed to address the welfare of these women or the children, nor embraced them with love and respect. Nor has the state conducted a systematic accounting of the rapes during 1971 (see War, Women and The Making of Bangladesh: Remembering 1971, Yasmin Saikia, Duke University Press 2011). What has the Bangladeshi nation done for the children of 1971? Have we, the people of Bangladesh, ever said, ‘Come back and let us embrace you with love?’ Can we not open our hearts to these children who are now adults in their early 40s? The tour de force that is In The Light of What Know takes one on a mesmerizing journey through the world of science, mathematics and great philosophical debates, yet at the end, one has no answer to the devil inside: our human capacity to dehumanize another. At its end, one is profoundly shaken to the core. Rahman is the author that I have been waiting for, one who will put the story of Bangladeshis on the global literary map. I hope that the poets and writers of Bangladesh will invite Zia Haider Rahman to visit his country to speak about his debut novel that has shaken the literary world. And to Rahman for writing this thought-provoking book for a not so brave or caring world––ten thousand salaams! Lamia Karim is associate professor of anthropology, University of Oregon-Eugene, USA. Clearly an excellent book to be read and discussed widely! An erudite, complicated but excellent novel. I’ve been teaching it, along with the works of Jhumpa Lahiri and Naipaul, in my Diaspora Writing course.